For general confession in the Lutheran Church, see Penitential Rite. Not to be confused with Church of the Lutheran Confession. In the Lutheran Church, Confession (also called Holy Absolution) is the method given by Christ to the Church by which individual men and women may receive the forgiveness of sins; according to the Large Catechism, the "third sacrament" of Holy Absolution is properly viewed as an extension of Holy Baptism. The Lutheran Church practices "Confession and Absolution" [referred to as the Office of the Keys] with the emphasis on the absolution, which is God's word of forgiveness. Indeed, Lutherans highly regard Holy Absolution. They, like Roman Catholics, see James 5:16 and John 20:22-23 as biblical evidence for confession. Confession and absolution is done in private to the pastor, called the "confessor" with the person confessing known as the "penitent". In confession, the penitent makes an act of contrition, as the pastor, acting in persona Christi, announces the formula of absolution. Prior to the confession, the penitent is to review the Ten Commandments to examine his or her conscience. In the Lutheran Church, like the Roman Catholic Church, the pastor is bound by the Seal of the Confessional. Luther's Small Catechism says "the pastor is pledged not to tell anyone else of sins to him in private confession, for those sins have been removed." If the Seal is broken, it will result in excommunication. In the nineteenth and twentieth centuries, private confession fell into disuse; at the present time, it is, for example, expected before partaking of the Eucharist for the first time. It is also encouraged to be done frequently in a year (specifically before Easter). In many churches, times are set for the pastor to hear confessions. 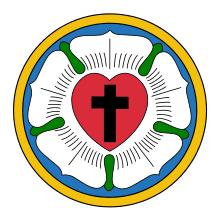 In line with Luther's initial statement in his Large Catechism, some Lutherans speak of only two sacraments, Baptism and the Eucharist, although later in the same work he calls Confession and Absolution "the third sacrament." The definition of sacrament in the Apology of the Augsburg Confession lists Absolution as one of them. Luther went to confession all his life. Although Lutherans do not consider the other four rites as sacraments, they are still retained and used in the Lutheran church. Philipp Melanchthon speaking about the Confession in the Lutheran Church, claims that "we do not wish to sanction the torture [the tyranny of consciences] of the Summists, which notwithstanding would have been less intolerable if they had added one word concerning faith, which comforts and encourages consciences. Now, concerning this faith, which obtains the remission of sins, there is not a syllable in so great a mass of regulations, glosses, summaries, books of confession. Christ is nowhere read there". In his 1529 catechisms, Martin Luther praised confession (before a pastor or a fellow Christian) "for the sake of absolution", the forgiveness of sins bestowed in an audible, concrete way. The Lutheran reformers held that a complete enumeration of sins is impossible and that one's confidence of forgiveness is not to be based on the sincerity of one's contrition nor on one's doing works of satisfaction imposed by the confessor (penance). The Roman Catholic church held confession to be composed of three parts: contritio cordis ("contrition of the heart"), confessio oris ("confession of the mouth"), and satisfactio operis ("satisfaction of deeds"). The Lutheran reformers abolished the "satisfaction of deeds," holding that confession and absolution consist of only two parts: the confession of the penitent and the absolution spoken by the confessor. Faith or trust in Jesus' complete active and passive satisfaction is what receives the forgiveness and salvation won by him and imparted to the penitent by the word of absolution. Here, the penitent is to confess whatever they have done against the commandments of God, according to their own place in life. The penitent continues. God be merciful to you and strengthen your faith. Do you believe that my forgiveness is God's forgiveness? In the stead and by the command of my Lord Jesus Christ I forgive you all your sins in the name of the Father and of the + Son and of the Holy Spirit. Amen. The pastor dismisses the penitent. I, a poor sinner, confess myself before God guilty of all sins; especially I confess before you that I am a manservant, a maidservant, etc. But, alas, I serve my master unfaithfully; for in this and in that I have not done what they commanded me; I have provoked them, and caused them to curse, have been negligent [in many things] and permitted damage to be done; have also been immodest in words and deeds, have quarreled with my equals, have grumbled and sworn at my mistress, etc. For all this I am sorry, and pray for grace; I want to do better. In particular I confess that I once cursed; again, I once used improper words, I have once neglected this or that, etc. Let this suffice. But if you know of none at all (which, however, is scarcely possible), then mention none in particular, but receive the forgiveness upon the general confession which you make before God to the confessor. As thou believest, so be it done unto thee. And by the command of our Lord Jesus Christ I forgive thee thy sins, in the name of the Father and of the + Son and of the Holy Spirit. Amen. Depart in peace. ↑ Apology of the Augsburg Confession, article 24, paragraph 1. Retrieved 2010-02-02. ↑ An example of a church that has a set time for confessions. Retrieved 2010-02-02. ↑ John 20:23, and Engelder, T.E.W. Popular Symbolics. St. Louis: Concordia Publishing House, 1934. pp. 112-3, Part XXVI "The Ministry", paragraph 156. ↑ Luther's Large Catechism IV, 74-75: "And here you see that Baptism, both in its power and signification, comprehends also the third Sacrament, which has been called repentance, as it is really nothing else than Baptism" (emphasis added; cf. Theodore G. Tappert, trans. and ed., The Book of Concord: The Confessions of the Evangelical Lutheran Church, (Philadelphia: Fortress Press, 1959), 751). ↑ The Apology of the Augsburg Confession XIII, 3, 4: "If we define the sacraments as rites, which have the command of God and to which the promise of grace has been added, it is easy to determine what the sacraments are, properly speaking. For humanly instituted rites are not sacraments, properly speaking, because human beings do not have the authority to promise grace. Therefore signs instituted without the command of God are not sure signs of grace, even though they perhaps serve to teach or admonish the common folk. Therefore, the sacraments are actually baptism, the Lord’s Supper, and absolution (the sacrament of repentance)" (cf. Tappert, 211). ↑ "Article XIII. (VII): Of the Number and Use of the Sacraments.". bookofconcord.org. 2011. Retrieved 8 October 2011. ↑ "Defense of the Augsburg Confession". Book of Concord. Retrieved 2013-11-02. ↑ "Christian Cyclopedia". Rejected ... are those who teach that forgiveness of sin is not obtained through faith but through the satisfactions made by man. ↑ "Christian Cyclopedia". The acts of the penitent himself, namely contrition, confession, and satisfaction, constitute, as it were, the matter of this sacrament. ↑ Bente, Gerhard Friedrich and William Herman Theodore Dau. Concordia Triglotta The Symbolical Books of the Evangelical Lutheran Church, German-Latin-English. St. Louis: Concordia Publishing House, 1921. pp. 555-556.